yes I installed the 32 drivers. yes I did a clean install. Look here https://forum.dji.com/thread-135981-1-1.html, you are not alone! Old post but had the same problem a while back. Discovered that Win 10 has a default enforcer mode for drivers. Win 10 will not install a driver without a &apos;valid digital signature&apos; ie the dji driver I had at the time. It will without notification install the nearest valid driver it has instead. 1. Hold &apos;shift key&apos; and restart Win 10. This will open the troubleshooting menu at startup. 2. Select advanced Option then opt to turn OFF enforcer mode for signatures. 3. 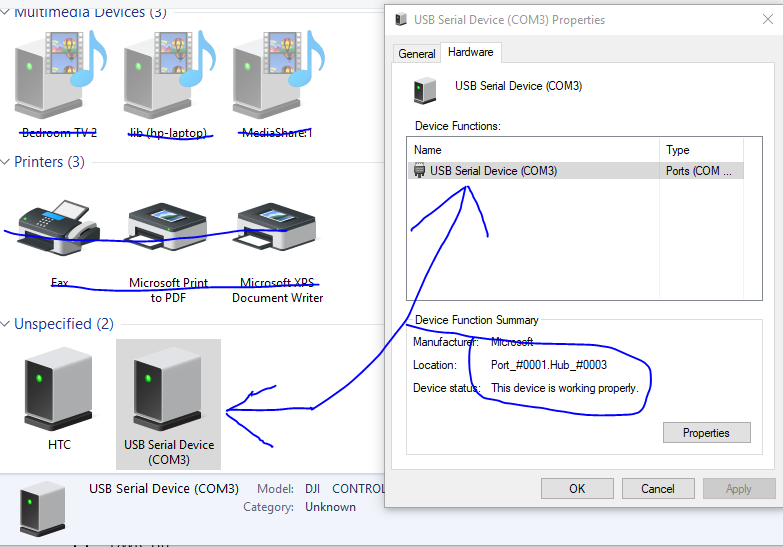 Re-boot normally and confirm choice. Simplest things first. Have you tried using a different cable. I know it says the port is working but this can happen. Look again, maybe you didn’t connect the cable correctly. There was a similar situation with me, and only after re-checking the cable everything turned out.